The Positive Youth Justice Model is built around the concepts and principles of positive youth development (PYD). These concepts offer valuable guidance for the design of interventions for youthful offenders. In the past, few programs have been designed in ways that were consistent with PYD principles, but this is changing. The Positive Youth Justice model suggests that blending the science of adolescent development with the practice principles of positive youth development could serve as an effective framework for designing general interventions for young offenders. The model encourages youth justice systems to focus on protective factors as well as risk factors, strengths as well as problems, positive outcomes as well as negative outcomes, and generally to focus on facilitating successful transitions to adulthood for justice-involved youth. The PYJ model includes 12 key components depicted as a 2 by 6 matrix. Each cell in the matrix represents the interaction of two key assets needed by all youth (learning/doing and attaching/belonging) with six separate life domains (work, education, relationships, community, health, and creativity). To implement the PYJ Model in youth justice settings, the ideas underlying positive youth development have to be focused more narrowly. The most common approaches to PYD presume that young people possess conventional attitudes and a ready willingness to cooperate with pro-social peers and adults. These are not qualities that one finds in abundance among youth involved with the juvenile court and the larger juvenile justice system. Almost by definition, court-involved youth have a greater inclination than do other youth to violate rules, disregard convention and defy authority. A positive youth development framework for these youth would have to be different from a framework designed for more conventional youth. Some features of PYD may be relevant for young offenders, but which ones? Which aspects of PYD are likely to be effective with youth who have already engaged in illegal behavior? Is there a way to adapt the principles of PYD for use in a justice environment? 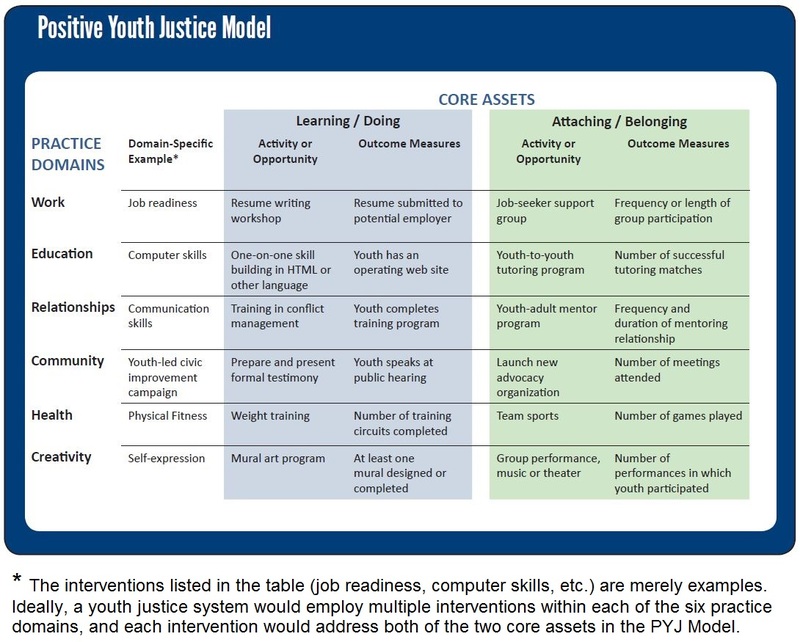 The premise of the Positive Youth Justice Model is that PYD could, and should be adapted for justice-involved youth. In fact, PYD might be well suited as the central theory of habilitation and rehabilitation for young offenders. Of course, other treatments and approaches will continue to be necessary as a supplemental response to particular subsets of youth in the justice system. Youth who commit violent acts, for example, will always prompt a strong response from law enforcement and corrections. Yet, the evidence is clear that punishment and deterrence are not effective strategies for helping youth to succeed at school and work. Furthermore, young people with drug dependencies will continue to need high-quality substance abuse treatments, but we know that drug treatment programs cannot prepare them to meet every challenge they will face in life. Youth with mental health problems need specialized interventions, but such programs are clearly not sufficient by themselves as a means of ensuring a successful transition to adulthood. All justice-involved youth, even those who require some of these specialized treatments, need basic supports and opportunities if they are to avoid future criminality and learn to lead positive, productive adult lives. Where should justice authorities turn to conceptualize and implement such interventions? The Positive Youth Justice Model is designed to facilitate this task.